A new era dawned in Victoria’s penal history after the war. Saanich Prison Farm, which for the past four years had housed military prisoners, became Coloquitz Mental Home. This was the first time in B.C. history that the mentally ill were separated from other prisoners. Coloquitz’s supervisor, Granby Farrant, wanted to rehabilitate its inhabitants through gentle, calming labour, such as maintaining the Home’s celebrated gardens. Unfortunately, in an era before mandatory psychiatric or legal reviews or standardized definitions of mental illness, Coloquitz could easily become a place to dispose of nuisances rather than a therapeutic home. After only brief interactions, the police often committed any itinerant, unemployed men causing disturbances to Farrant’s charge. 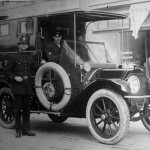 The first motorized police vehicle, this cadillac, was purchased in 1918 by Chief John Fry. Victoria Police could not incarcerate all who caused disturbances, however, as many Victorians openly defied the Prohibition Laws which banned the possession of alcohol. In 1918, federal prohibition, designed to conserve grain to feed allied troops, was no longer in effect, but provincial prohibition remained and was far from popular. The laws unfairly targeted the poor; the affluent could afford to import liquor from other provinces, as was still permitted. Yet disobedience was rampant among all classes. Doctors could prescribe alcohol for medicinal purposes, leading a variety of Victorians feigning coughs and limps to stagger into medical offices and quietly offer two to four dollars for their prescription. Every time the Prohibition Commissioner created a new water-marked prescription form to slow the tide of illicit prescriptions, it was adeptly and prolifically counterfeited. “Near-Beer Bars,” which supposedly sold drinks with only 1.25 percent alcohol (under the legal limit), were widely acknowledged to offer stronger substances. When the Canadian soldiers of the Siberian Force spent an evening in Victoria, prior to leaving for Vladivostok, Russia to defeat Bolshevik forces, they were forbidden to enter several “near beer” bars. In 1921, the police were forced to play a central role in the rancorous disputes between supporters of prohibition and its detractors. Police Commissioner Joe North claimed several Chinese gambling houses were under police protection and, much to his surprise and confusion, was subsequently arrested for allegedly causing the Chief to neglect his duties by permitting the operation of lottery and gambling houses in Chinatown. North was acquitted, but was arrested again soon afterwards for drunkenness and fined $100. North ran for Mayor in 1921 on a temperance platform, but could not keep his grievances with police out of his campaign. After claiming that the police were “alcoholised forces of iniquity” and accusing city detectives of involvement in white slavery, North was successfully sued for libel in a trial that polarized Victoria’s pro-temperance and anti-prohibition forces. The Prohibition laws, and the havoc they had created in Victoria’s judicial and municipal affairs, were inspiring a spirited civic debate about the meaning of justice and criminality. Robert Menzies, “The Making of Criminal Insanity in British Columbia: Granby Farrant and the Provincial Mental Home, Coloquitz, 1919-1933,” in Essays in the History of Canadian Law Volume 6, ed. David H. Flaherty, John McLaren, Hamar Foster (University of Toronto Press, 1995), 274, 285-286, 288. Douglas L. Hamilton, Sobering Dilemma: A History of Prohibition in British Columbia (Vancouver: Ronsdale Press, 2004), 129, 143-149. Greg Marquis, “Vancouver Vice: The Police and the Negotiation of Morality, 1904-1935,” in Essays in the History of Canadian Law Volume 6, ed. Hamar Foster and John McLaren (Toronto: University of Toronto Press, 1995), 267. Michael Kluckner, Victoria: The Way It Was (Altona, Manitoba: Whitecap Books, 1986), 58. Hamilton, Douglas. Sobering Dilemma: A History of Prohibition in British Columbia. Vancouver: Ronsdale Press, 2004. Kluckner, Michael. Victoria: The Way It Was. Altona, Manitoba: Whitecap Books, 1986. Marquis, Greg. 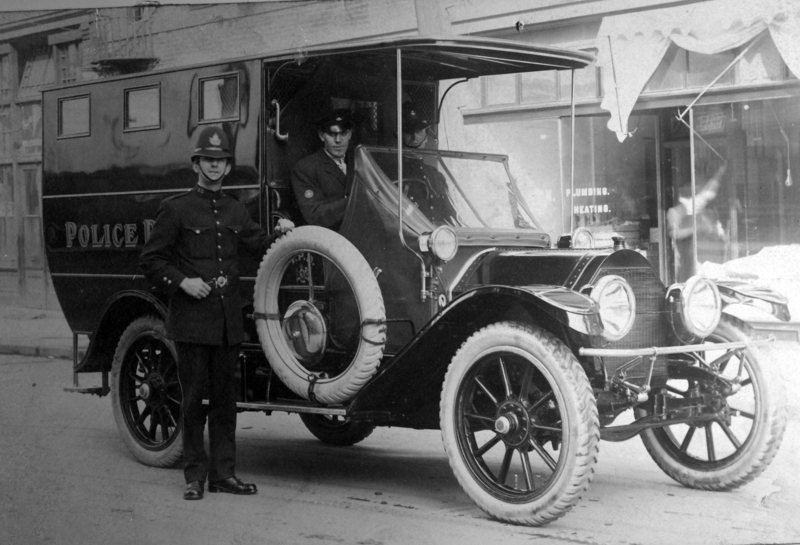 “Vancouver Vice: The Police and the Negotiation of Morality, 1904-1935.” In Essays in the History of Canadian Law Volume 6, edited by Hamar Foster and John McLaren, 242-273. Toronto: University of Toronto Press, 1995. Menzies, Robert. “The Making of Criminal Insanity in British Columbia: Granby Farrant and the Provincial Mental Home, Coloquitz, 1919-1933.” In Essays in the History of Canadian Law Volume 6, edited by David H. Flaherty, John McLaren, Hamar Foster, 274-312. Toronto: University of Toronto Press, 1995.